Simple, Reliable Operation These cappers are very easy to install, don’t require highly trained operators and are guaranteed for 12 months. Capping System Containers held in place by lateral belts pick up thee caps that will screw in place by rotary tangent discs. Speed to 150 ppm. Versatility Standard equipment doesn’t require change parts to work with a wide range of products, from vials to gallons. 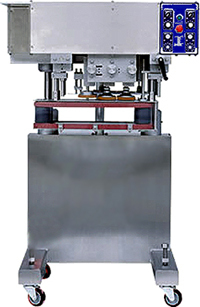 Simple turning of knobs adjusts cap delivery, cap size, cap height, torque, machine height, belt separation, etc. Bottle Gripper Belts Reinforced gripper belt drive system comes standard with one set of belts, we also offer multiple belts (2 or 3 on each side). Material, size and separation of the belts are custom designed for each customer. Construction One piece stainless steel 304 welded frame under rotary casters. 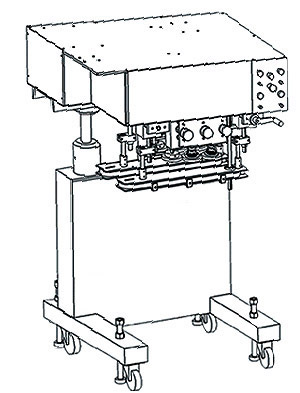 C frame design allows installations on different working conveyors. Electric Panel All logic functions are controlled by a PLC. In the panel you can control each machine function independently: Start, Emergency Stop, Conveyor speed, piston and nozzle quantities, bottle counter and strokes per cycle.